This conversation about zoos and aquariums is something I have thought about on a daily basis since 2008, when I began a project centered on captive elephants. 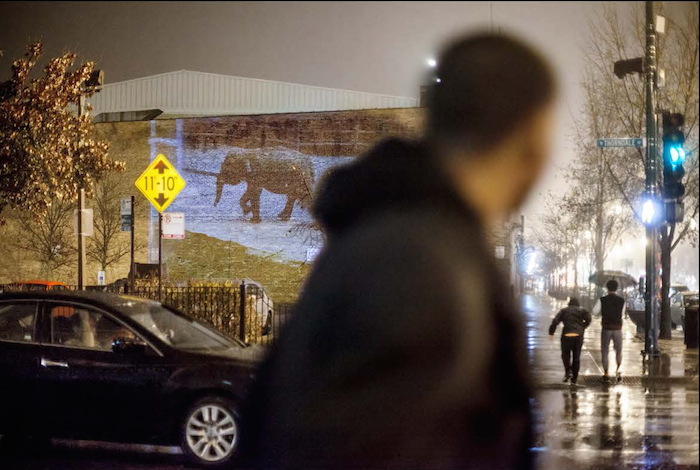 Between 2009 and 2014, I traveled to fifty zoos that keep elephants in the US, shooting video, which became the twelve-minute film Thirty Times a Minute, of elephants exhibiting what biologists refer to as stereotypic behavior. Only captive elephants exhibit this behavior, which includes rhythmic rocking, swaying, swinging the trunk, head bobbing, stepping back and forth, or pacing. These compulsive, repetitive movements cause debilitating, life-threatening damage to the animals’ feet and joints. So, how can zoos and aquariums foster cultures of care and conservation? Be more honest: this is the hope I have for zoos and aquariums in the future. I hope they will tell people the straight truth about the neurotic behavior of animals in captivity and why these animals are being held captive. I hope they will tell people that these animals’ natural habitats are disappearing, and ask if they want to help do something about it. The charade of entertainment needs to stop completely and we have to get serious about these matters. Entertainment that attempts to educate is still entertainment. With that said, I do see a lot of progress at zoos. Many are trying to figure out better ways to give animals a somewhat natural existence, but they still need a conceptual and practical overhaul: Saving species? Profit? Conservation? Education? What is the goal? The fact that seventeen elephants were shipped to the United States from Swaziland, before a court order could stop it, reveals the powerful forces that are in place at zoos. Elephants are emotional, intelligent creatures and those seventeen smart creatures are now going to live their lives on display for us in Dallas, Wichita, and Omaha. If zoos were interested in the welfare of those elephants, who lived in an overcrowded and drought-plagued area, they would instead fund the animals’ move within Africa, where they could live free and thrive rather than continue to decline in zoos, where they cannot breed successfully. Instead of putting millions of dollars into slightly larger zoo enclosures that will never be sufficient, those funds could be used to aid anti-poaching efforts. To me, that would actually be an effective species survival plan. Should zoos cease to exist as we know them? For me, the answer is yes. Keeping animals captive is, without a doubt, inhumane. I have watched too many captive animals displaying self-destructive or neurotic behaviors to think otherwise. But, to be honest, I waiver in my views whenever I go to a zoo to make photographs or video for the project: I see the hard-working zookeepers and the lovely walkways and all the cool animals and families trying to have a good time (well, mostly kids begging for snacks, momentarily pointing out an animal but then quickly searching for something more interesting, the next thing). So, is there a benefit to keeping animals on display? Zoos are seductive, especially if you love seeing animals. They make it easy for us to overlook the animals’ actual captive situation. Zoos exist for us, and always have, from the beginning, when landlords had menageries. But despite the history and controversy of these institutions, our ticket money does in fact support a lot of good conservation efforts. But not enough. Not enough to validate the costs to other animals of having to live in the same small spot for their entire lives. We have to figure out another way to show our love for animals. We could show our care and our intelligence by not keeping them captive. We can hold zoos to a much higher standard; it’s an insult to our intelligence that we’re expected to have fun viewing captive animals when, if we really consider what captivity entails, it is sad to see animals in captivity. Kids are compassionate; if parents walked through a zoo explaining the history of zoos and the colonial thinking that produced these institutions, kids would surely be happy to know that their entry ticket paid for them to have conservation experiences not involving captive animals, but rather learning to connect with and care for animals in other ways. From my observations, after visiting many zoos, I believe zoos could increase ticket sales by adding more play or climbing areas or other physical activity options for the human animals. Those are the hottest spots at every zoo, because children make up the zoo’s biggest constituency. Zoos are one of the main public spaces where we learn our culture’s ways of relating to others—animals and, by extension, each other. So changing the way zoos operate could really spark a change in our culture, a change toward a more compassionate, caring culture, a conserving—rather than consuming—culture. Of course we cannot empty zoos, but an honest first step would be to start calling zoos “hospitals.” When we go to a zoo, we are pretty much visiting a nice hospital where the patients are fed, cared for, medicated, and managed. Next, we need to figure out how to switch from hospital to sanctuary. But my biggest hope is that we can redirect our focus to save habitat, as E.O. Wilson advocates. Why continue to build more expensive animal enclosures when the actual sustainable thing to do would be to support conservation efforts, to stop taking over the land outside of the zoo’s boundaries, which these wild and wonderful creatures need? We have lost half of the Earth’s wildlife population in the past forty years due to human consumption. The current prediction is that elephants will be extinct within fifteen years. This is horrifying. Captivity will not save elephants, only protecting wild elephants and their habitat will save them. Captive elephants do not thrive, no matter the amount of money spent on their enclosures. Elephants require vast amounts of space and need to live in herds. There is a blind spot exhibited by many researchers and zoo leaders regarding the pathetic reality of a captive elephant’s life. I have witnessed and filmed hundreds of captive animals. Captivity in zoos will never be an adequate solution for saving the largest mammals, only protection of these animals in the wild offers a serious approach for countering their risk of extinction. Zoos feed our desire to be close to animals and this desire is a beautiful thing. The impulse to connect is awesome and fascinating. But we have to show restraint and be smarter and kinder than we have been in the ways we go about connecting with other species. Our relationships with animals are shrouded in contradictions. We love and admire them; we are entertained and fascinated by them; we take our children to watch and learn about them. Animals are embedded within human history—evident in our stories, rituals, and symbols. At the same time, we eat, wear, and cage them with seeming indifference, consuming them, and their representations, in countless ways. But we can choose to foster relationships of coexistence rather than consumption. 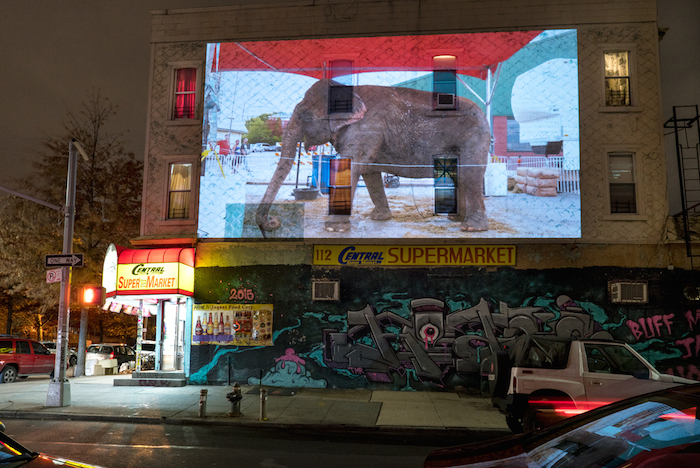 Every time I install a public projection of my twelve-minute video of captive elephants Thirty Times a Minute, the response from passers-by reinforces my purpose. These films are a gesture of healing for the captive animals and anyone who relates to these animals, perhaps feeling captive in whatever circumstance. Once the unnoticed or unknown is made visible, we can’t remain in denial. It can no longer be pleasurable to watch captive elephants, no matter how fascinating and giant and beautiful they are. Seeing is an avenue to compassion; often without seeing, mythology holds power. I am doing this work not just to raise awareness about captive elephants or to inject it into the public sphere. Ultimately, I am showing this video around the world to dispel the myth: Thirty Times a Minute is proof that we need better solutions as elephants face extinction—that captivity will never be sufficient. Mason, G., & Rushen, J. (2006). Stereotypic animal behaviour: Fundamentals and applications to welfare. Wallingford, UK: CABI Pub. 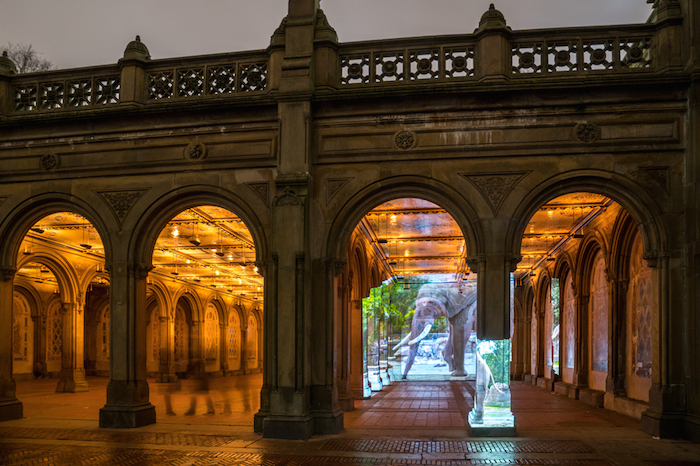 Tembo (Berlin, Germany) at Bethesda Terrace, Central Park, New York City, 2016. Rose-Tu (Portland, Oregon) at Broadway Armory, Chicago, Illinois, 2014. 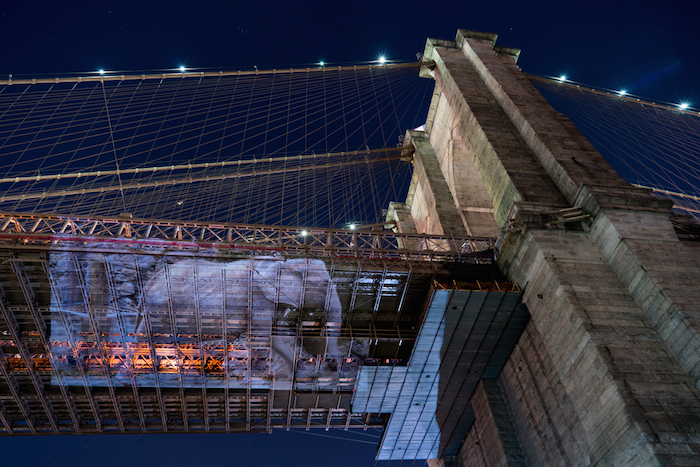 Drumbo (Vienna, Austria) at Brooklyn Bridge, New York City, 2016. Cindy (Peru, Indiana) at Central Supermarket, Bushwick, Brooklyn, New York City, 2016. 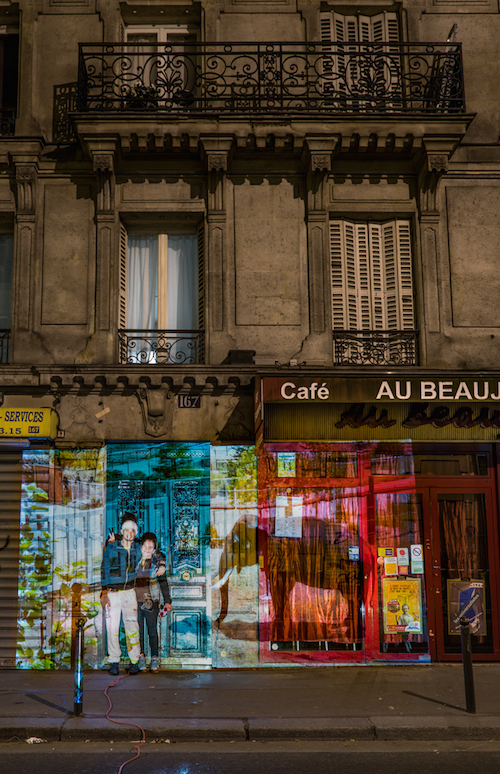 Rex (Oklahoma City, Oklahoma) and Parisian couple at Rue du Faubourg Poissonnière, Paris, France, 2016. Colleen Plumb's work has been widely published and exhibited. She teaches in the Photography Department at Columbia College Chicago and lives in the Edgewater neighborhood in Chicago with her husband and two daughters.